I miss Sunday lunches of old – whiling away the afternoon in cosy pubs with chat and Sunday Times Style. Sunday lunches out are now quite rare due to Miranda’s nap, as we’d have to eat at a weird time. 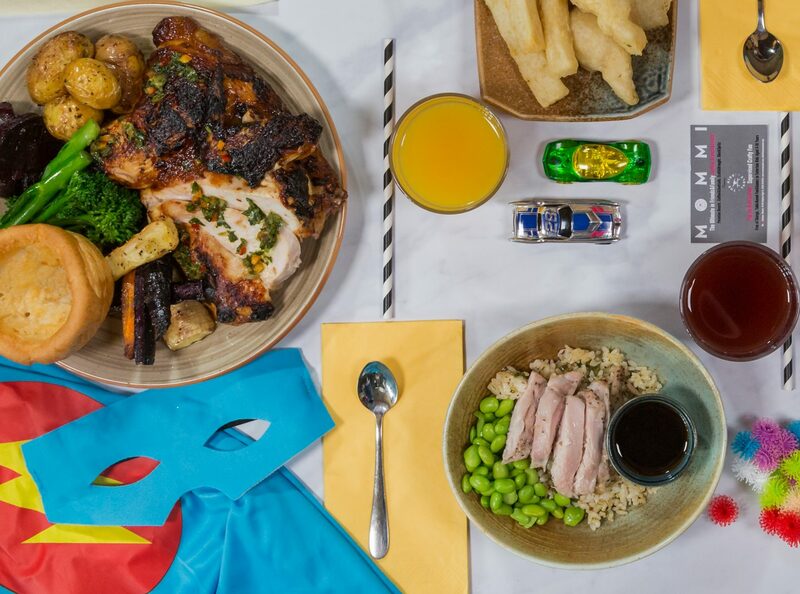 So, it was an exciting event in the O’Shaughnessy house last week when we were invited to try Mommi, a Peruvian/Japanese kid friendly restaurant in Clapham. Mommi has – get this – free DBS checked child carers and a colourful, abundant activity table for 3-10 year olds. We left Miranda with the grandparents for her nap, and Ed, Nathan and I headed over to Clapham. With places that attempt to combine kids’ activities and food, either one or both is usually lacking. Happily, not so with Mommi. What makes it such a kid friendly restaurant? The childcare and pop up activity table runs every Sunday from 1-5pm. It’s a big table – enough for around ten kids to gather round. It’s packed with lego, sticklebricks, beads, kids’ transfer “tattoos”, sparkly pom poms and other crafty bits and pieces. The two women running activities were great at welcoming Nathan and helped him create a Halloween mask. The family tables are by the activity area, so you can keep tabs on your little one. Nathan can be a bit reluctant to leave our sides, but he soon forgot about us and enthusiastically got involved. So much so, he wasn’t really interested in eating his food, but hey, you can’t have everything. Ed and I however, were VERY interested in the food… and cocktails. We had starters of ceviche and and sticky miso chicken wings. A week later and I’m still thinking about the ceviche; the salmon, sea bass and tuna chunks were in an amazing tangy mango sauce. The wings were good too, and came with a really tasty dipping sauce. For mains, I had the flat iron steak and chips and Ed had the house burger, which were both enjoyable. And the chocolate chip brownie dessert was fabulous – not so much the brownie but the rich, thick, dark chocolate mousse that surrounded it. The service at Mommi was faultless and the ambience was upbeat and fun. It would be great for adult groups for a family celebration or birthday too. I am surprised that the family section wasn’t totally full on Sunday as it’s the perfect kid friendly restaurant for lunch. Get there soon before everyone else finds about it!